Southern Ontario is a primary region of the province of Ontario, Canada, the other primary region being Northern Ontario. It is the most densely populated and southernmost region in Canada. The exact northern boundary of Southern Ontario is disputed; however, the core region is situated south of Algonquin Park, the latter being in an area of transition between coniferous forest north of the French and Mattawa Rivers and southern deciduous forest. It covers between 14 and 15% of the province, depending on the inclusion of the Parry Sound and Muskoka districts which also lie in the transitional area between northern and southern forest regions. With more than 12.7 million people, the region is home to approximately one-third of Canada's population of 35.1 million. Southern Ontario differs greatly from Northern Ontario, in that it has a much larger population density, a different climate, and a different culture than its northern counterpart. It is broken into smaller subregions, including Central Ontario, Georgian Triangle, Southwestern Ontario, the Golden Horseshoe, and Eastern Ontario. The core area of Southern Ontario is part of the Quebec City–Windsor Corridor, which extends northeast into southern Quebec. The transitional northern area of this primary region extends north to the Mattawa River and occupies part of the Grenville Geological Province of the Canadian Shield which also extends northeast into southern Quebec; most of Northern Ontario lies within the Superior Geological Province. Southern Ontario can be distinguished from Northern Ontario because it is far more densely populated and contains the majority of the province's cities, major roads, and institutions. Northern Ontario, in contrast, contains more natural resources and remote wilderness. Although it has no saltwater coastline, the region has an abundance of freshwater coastlines on three Great Lakes (Huron, Erie and Ontario), as well as smaller lakes such as Lake Simcoe and Lake St. Clair. It is a major vineyard region and producer of Canadian wines. While Southern Ontario has been a part of the province of Ontario since its establishment at Confederation in 1867, previously forming the colony of Upper Canada, a large portion of Northern Ontario did not become part of Ontario until 1912. Territorial Southern Ontario was explored and colonized by the French in the 17th century, who forged relations with the Wyandot Huron people, based around the Georgian Bay/Lake Simcoe area. Other Iroquoian speaking people to the south were the Petun and Neutral Nation, and further northeast, Algonquins inhabited the upper Ottawa River/Madawaska Valley areas and the Mississaugas moved south from northern Lake Huron, settling lands in both the Kawartha region and just west of Toronto. Following the Seven Years' War, the British wrested control of Southern Ontario, and greater colonization efforts were spurred on by the arrival of United Empire Loyalists brought on by the American Revolution. Southern Ontario was where a large portion of the battles took place during the War of 1812, and was a major destination for escaping slaves using the underground railroad. Following the enactment of Prohibition in the United States in 1919, Southern Ontario immediately became a hotbed of smuggling alcohol (spirit) across the border. Southern Ontario is home to over 94%, or 12.1 million, of Ontario's total population of 12.9 million people (and about 35% of Canada's total population), compared to approximately 750,000 in Northern Ontario. This is due to many factors, including the more arable land in the south, its more moderate climate, well-used transportation (water, land and air) routes, proximity to populated areas of the Northeastern and Midwestern United States, as well as a long history of early European settlers and colonialism. For thousands of years, Ontario has been home to indigenous aboriginal communities, with numerous nations with differing languages at the time of European contact. Over 200,000 aboriginal Canadians live in Southern Ontario today. Southern Ontario was colonized by the French and the British. After the area began to be developed for European settlement, especially after the American Revolutionary War, other European immigrants arrived as well, with increased immigration in the late 19th and early 20th centuries. Since the late 20th century, many immigrants have come from Asia and other parts of the world. The region is one of the top destinations for immigrants worldwide, particularly the Greater Toronto Area. The area has a large manufacturing sector. Since the mid-2000s, Ontario has produced more vehicles per year than the state of Michigan. In a cross-border definition, a swath of Southern Ontario could be considered a part of the Rust Belt. Factory closings because of industry restructuring, globalization (corresponding movement of jobs overseas and to non-unionized labour markets in the United States) have for the past few decades taken their toll. This is most evident in the region's southern tier cities which have large automobile or associated industrial bases, such as Windsor, London, St. Thomas and St. Catharines. Still affected by these factors but to a lesser extent is Hamilton, the centre of steel production, and Sarnia, the centre of petrochemical production. The province's two largest cities, Toronto and Ottawa, have moved increasingly to a service and knowledge economy, although Toronto still has a strong industrial presence spread over wide areas along its rail and highway corridors as well as a container port linking it to the St. Lawrence Seaway. Toronto, the largest city of the province, is the site of all of the major Canadian banks and its heart has the country's financial sector, including the Toronto Stock Exchange. Ottawa, the national capital, has an economy that is heavily dependent on the public sector, in addition to having a strong technology sector. Some parts of Southern Ontario are heavily entwined with bordering cities in New York and Michigan in terms of industry and people. The focus areas are the Buffalo–Niagara, Sarnia and Detroit–Windsor. Many people work and live on opposite sides of the border. The NEXUS program for frequent travelers across the border is increasing in popularity among bordering communities. Other areas with heavy trade traffic with Southern Ontario include Montreal and the province of Quebec, parts of northern Ohio, and western Pennsylvania. Southern Ontario is well known for its attractions and tourism. Some popular tourist attractions include the CN Tower, Parliament Hill, Niagara Falls, National Gallery of Canada, Canada's Wonderland, CNE, Caesars Windsor, Canadian War Museum, Toronto Zoo, Hockey Hall of Fame, Ripley's Aquarium of Canada, Royal Canadian Mint, Marineland, The Rideau Canal, the Canadian Museum of History and the Royal Ontario Museum. Niagara Falls is the 6th most visited attraction by domestic and international tourists in the world, with over 14 million tourists each year. In 2006, Toronto was the 14th most visited city by international tourists in the world, with over 4.1 million visitors in the year. Ottawa is the most visited city in Canada by domestic tourists, hosting over 6.9 million Canadian visitors per year. Southern Ontario is home to several professional sports teams, including the Ottawa Senators, Toronto Maple Leafs, Toronto Blue Jays, Toronto Raptors, Ottawa Fury FC, Toronto FC, and three teams in the Canadian Football League, Hamilton Tigercats, Ottawa Redblacks, and Toronto Argonauts. The region also hosts the Canadian Open in golf and Canada Masters in tennis. The area sponsors many internationally renowned festivals and events, including Toronto International Film Festival, Winterlude, Caribana, Bluesfest, Pride Week, Kitchener Oktoberfest, Havelock Jamboree, Toronto Indy, Sarnia Bayfest, Canada Day in Ottawa, International Freedom Festival in Windsor, Stratford Festival, Shaw Festival and Virgin Festival. Several large legal gambling establishments have been built throughout the Province, with Caesars Windsor and Fallsview Casino being the two flagship casinos. In addition to casinos, Ontario has many legal horseracing facilities with slot machines. Racetrack slots are located throughout the Province. All gaming in the Province is overseen by the Ontario Lottery and Gaming Corporation (OLG), and the Alcohol and Gaming Commission of Ontario. Southern Ontario has many natural attractions. Wasaga Beach, Grand Bend, Sauble Beach, and Sandbanks are beaches along the Great Lakes. The Niagara Escarpment offers hiking, skiing, and hundreds of waterfalls, including Niagara Falls. The Ottawa River has white-water rafting which attracts rafters and kayakers from all over the world. Ontario Parks governs all provincial parks, and Parks Canada governs all national parks. Southern Ontario is home to both Canada's largest city (Toronto) and the national capital city (Ottawa). Toronto is Canada's largest, and North America's fourth-largest, city. According to the 2011 census it had a population of 2.6 million and a metropolitan population of over 5.5 million. 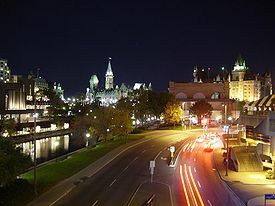 Ottawa is Canada's fourth largest city and capital city. It is home to most federal government departments and the Parliament of Canada. It has a population of 964,743, and a metropolitan population of over 1.4 million. Southern Ontario contains the only city (but not the only community) in the nation from which one can travel north to the contiguous United States: Detroit, Michigan is north of Windsor, Ontario. Southern Ontario communities have 13 telephone area codes: 226, 249, 289, 343, 365, 416, 437, 519, 548, 613, 647, 705, and 905. Statistics Canada's measure of a "metro area", the Census Metropolitan Area (CMA), roughly bundles together population figures from the core municipality with those from "commuter" municipalities. Note: A city's Metropolitan area may actually be larger than its CMA. For example; Oshawa is part of the Greater Toronto Area; however, it is considered its own CMA. The region is broken up into 40 census divisions, including 22 counties, eight regional municipalities, nine single-tier municipalities and depending on its inclusion, one district. The line between the counties and regions of the south and the districts of the north can be considered a boundary between Southern and Northern Ontario. 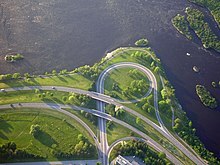 This is disputed however, as the demarcation line that is referenced in provincial documents is the Nipissing Passageway, originally an Indian trail between Georgian Bay and the Ottawa River. The trail follows the French River from Georgian Bay to Lake Nipissing. At North Bay, 2 kilometres (1.2 mi) of land separates Lake Nipissing from Trout Lake. From Trout Lake, the trail follows the Mattawa River to the Ottawa River. 1 Muskoka and Parry Sound are commonly regarded as a transitional region between Southern and Northern Ontario. Both divisions may be regarded as northern districts geographically, culturally and politically in some contexts. The 2011 census revealed that the major urban divisions of York, Halton, Peel and Ottawa had the largest growth. While the heavy industrial divisions of Chatham, Lambton, and Essex, as well as the mainly recreational divisions of Huron and Prince Edward had a decrease in population. Southern Ontario has long been an international destination for higher learning. It houses numerous internationally acclaimed public universities and colleges amongst its 13 universities and 20 colleges. It is also home to numerous private post-secondary institutions. Many notable Canadians have been born in Southern Ontario, owing to its nature as Canada's largest concentration of population. Toronto is notable for its multiculturalism and cosmopolitan nature: it has been called the most diverse city in the world. Southern Ontario also features in the literary genre of Southern Ontario Gothic, a major strand in Canadian literature. Southern Ontario has a highly developed transport system including many highways, airports, trains and buses. The freeway system in Southern Ontario is referred to as the King's highways system, or the 400 series highways. The freeways are digitally monitored by the Ministry of Transportation (Ontario) using the COMPASS-Freeway Traffic Management System With the long-awaited upgrade of Highway 406, all the freeways in Ontario are at least 4 lanes wide, fully controlled with interchanges and divided. The major freeways are 400, 401, 402, 403, 404, 405, 406, 407 (Toll), 409, 410, 412 (Toll), 416, 417, 420, 427, Don Valley Parkway, Gardiner Expressway, Queen Elizabeth Way, Queensway, Lincoln M. Alexander Parkway, Red Hill Valley Parkway, Conestoga Parkway, and the E. C. Row Expressway. Southern Ontario has several border crossings with the USA, including the Ambassador Bridge, Detroit–Windsor Tunnel, Peace Bridge, Rainbow Bridge, Thousand Islands Bridge, Ogdensburg–Prescott Bridge, Lewiston–Queenston Bridge, and the Blue Water Bridge. The region has a long history of marine transportation, with hundreds of millions of tonnes of cargo moving along the Great Lakes, and Saint Lawrence Seaway each year. The Welland Canal is a vital part of the Great Lakes Waterway allowing ships to avoid Niagara Falls. The St. Clair River and Detroit River are also well travelled rivers between Lake Huron and Lake Erie in the Windsor, Sarnia area. Southern Ontario also has thousands of other fresh water lakes and rivers, as well as the Trent-Severn Waterway and Rideau Canal. An inter-city train service in the region is provided mainly by Via Rail. The Greater Toronto area also has a commuter train system called the GO Train, which is supplemented by a network of bus services. There are several major international airports including the busiest airport in the country, Toronto Pearson International Airport (ranked 15th busiest worldwide by flights in 2014), Ottawa Macdonald–Cartier International Airport, John C. Munro Hamilton International Airport, London International Airport, and Region of Waterloo International Airport. Many Southern Ontarians living close to the Michigan or New York State borders use either Detroit Metropolitan Wayne County Airport, or Buffalo Niagara International Airport as their local airport. Harsh weather is not uncommon in the region, in the early summer months Southern Ontario is sometimes victim to tornadoes but far more often, straight line wind damage, hail and localized flooding from severe thunderstorms. Although the majority of tornadoes rarely cause excessive damage, the region is on the periphery of Tornado Alley and (F4) tornadoes touchdown every few decades causing widespread damage. Southern Ontario also gets hurricane remnants, floods, ice storms, heavy fog, hail, and blizzards. Small earthquakes occur in the region. The Mw  5.8 Cornwall–Massena earthquake occurred in 1944 and had a maximum Mercalli intensity of VII (Very strong). Many tourists visit the area in the autumn months to look at the bright vibrant colours of fall foliage. Southern Ontario has a very different climate from the rest of the country. It is the only area of Canada that has Carolinian forest. Many trees, plants, and wildlife in Southern Ontario are not found anywhere else in Canada. Some rare trees to Canada in this region include the tulip tree, pawpaw fruit tree and the cucumber tree. The Carolinian forests of Southern Ontario have in large part been destroyed by development sprawl. Very few original growth areas remain. The region has the most fresh water beaches in the nation. With relatively warm waters by mid-summer due to the hot and humid summer months and significant coastlines with white sand, the major beaches in the region are visited by millions of tourists every summer. The most popular beaches are Wasaga Beach, Grand Bend, Sauble Beach, and Sandbanks. ^ "Battles". The War of 1812 Website. The Discriminating General. Retrieved May 29, 2011. ^ "Showing Gratitude during Black History Month". Ontario Black History Society. Retrieved May 29, 2011. ^ "Census 2001 Highlights: Factsheet 5: Immigration to Ontario". ^ "Ontario auto industry outpaced Michigan last year". Investment Executive. February 1, 2005. Archived from the original on 2011-09-28. Retrieved May 19, 2011. ^ Craig S. Campbell, "Rust Belt," in The American Midwest: An Interpretive Encyclopedia, eds. Richard Sisson, Christian Zacher, and Andrew Cayton, Indiana University Press, 2007, p. 78. ^ Caroline Bremner (October 2007). "Top 150 City Destinations: London Leads the Way". Euromonitor International. Retrieved May 19, 2011. ^ "Cashing in: The economic impact of an Ottawa casino". August 2013. Archived from the original on 2013-10-13. Retrieved October 12, 2013. ^ "Slots and Casinos". Ontario Lottery and Gaming Corporation. Archived from the original on 2011-07-04. Retrieved May 19, 2011. ^ "Caesars Windsor". Caesars License Company, LLC. Retrieved May 19, 2011. ^ "Fallsview Casino Resort Home". Fallsview Casino Resort. Retrieved May 19, 2011. ^ "Welcome to the Alcohol and Gaming Commission of Ontario". Retrieved May 28, 2011. ^ "Geographic Units: Census Metropolitan Area (CMA) and Census Agglomeration (CA)". Statistics Canada. Retrieved May 28, 2011. ^ "Population and dwelling counts, for Canada, provinces and territories, census metropolitan areas and census agglomerations, 2006 and 2001 censuses - 100% data". Statistics Canada. 2008-11-05. Retrieved 2009-04-01. ^ Peake, Michael. "French River: Canoeing the River of the Stick-Waivers". All About Canoes. Canoe.ca. Retrieved May 28, 2011. ^ Woodrow, Maureen. "Challenges to Sustainability in Northern Ontario". Environmental Commissioner of Ontario. Archived from the original on 2009-10-03. ^ "Toronto: 'most multicultural city in the world'". Pittsburgh Post-Gazette. Retrieved 2015-10-27. ^ "Welcome to the Traveller's Road Information Portal (TRIP)". Ontario Ministry of Transportation. Retrieved May 28, 2011. ^ "Trains by Region". viarail.ca. Via Rail Canada Inc. Retrieved June 2, 2011. ^ "GO Transit". GO Transit. Retrieved June 3, 2011. ^ "Ontario Climate". Ontario Ministry of Agriculture, Food and Rural Affairs. April 7, 2011. Retrieved June 3, 2011. ^ "Interactive Canada Koppen-Geiger Climate Classification Map". www.plantmaps.com. Retrieved 2018-10-11. ^ "Weather and Meteorology: Hazardous Weather; Summer Weather; Summer Hazards". Environment Canada. Aug 4, 2010. Retrieved June 3, 2011. ^ "What is a Carolinian Forest?". Carolinian Canada. Retrieved May 29, 2011. Chapman, L. J. and Putnam, D. F. The Physiography of Southern Ontario. 3rd ed. Toronto: Ontario Ministry of Natural Resources, 1984. (Ontario Geological Survey. Special volume 2) ISBN 0-7743-9422-6.